I’d never bet on the football before. Maybe I’m a bit of an anomaly, but it seems everyone is betting on sports or in the very least has done it a handful of times. In the age of fantasy football, celebrity bloggers and endless stats, you’d think having a punt on the weekends matches would be easy; that is, until you actually try to do it. When you don’t have a lot of money, like me, you don’t want to throw it away and if you don’t know what you’re doing, like me, you might as well find a nice charity to donate it to. So, what’s a betting virgin to do? I was given the opportunity a few weeks ago to answer that question; really, you could just ask your mates, but in the age of the internet, you open your web browser to get help and that’s where Betegy.com comes in. BETEGY is a genius algorithm-driven service that provides precise football predictions using statistical analysis. Unlike your mates, Betegy isn’t biased towards one team or another. Numbers, as much as people try to twist them to suit their own needs, don’t care what shirt the teams are wearing. Algorithms can’t be swayed by tribalism. The numbers know what they’re doing. The blowhards down at the pub might think they know the score but, except for the lucky breaks that are few and far between, they’re mostly just sounding off. But, like I said, up to this point I’d never bet on football before, so what would I know? So, I had a few words with the creators of the site. So, bring me up to speed here…you guys use a special algorithm to calculate the outcome of matches from each of the top-flight leagues from around Europe? Absolutely correct, BETEGY uses a self-learning algorithm to calculate the probabilities in football and chooses the best odds for betting. Right now we only predict for the top 5 leagues in Europe but hope to increase this number soon. Suppose there’s a few math books piled up in a closet somewhere. Do you have someone watching each of the leagues or do you run the same algorithm on each of them? We use some mathematical models to analyze statistical patterns from each league and tweak them accordingly (e.g. In the German Bundesliga more goals are scored in comparison to the French Ligue). In other words, our algorithm does tailored made predictions for each league automatically; we just monitor the outcomes and make corrections if something goes completely wrong. Sounds like a pretty solid model to me, but almost anything in theory will work. This is a results business and, like I said earlier, I’m not exactly flush with cash I’m ready to piss away. Well, I used the service for a few weeks and, although I knew this going in, it’s pretty obvious that sports prediction isn’t an exact science. With that being said, the first week didn’t go too bad. At this time, Betegy provides predictions for the five major leagues in Europe, so why not have a pop at one match from each? If you don’t know what you’re doing, sports’ betting is more complicated than it needs to be; so, I just stuck with the good old win, lose or draw. A £5 bet on each of the matches meant that I walked away with more than I came in with. At the end of the day, not losing money was what I was aiming for and that meant week one using Betegy was mission accomplished. Now that I had a few quid more, it was time to dive into this a little further. Betting against your own team is never fun, but I had to do it in order to give Betegy a fair crack. This time out, instead of dropping a bunch of £5 bets across the spectrum, I focused on two matches and played both single and multi-bets. Single £5 bets for Man United to beat Liverpool, Man United to score 2 and Liverpool to score 1 were doubled up with the same bets, but on a multi-bet platform. Let’s just say I won each of my single bets — which didn’t pay out that great on each individual one — plus I of course cleaned up on the multi-bet which paid out large since each of the bets within were won. I did alright on the single bets for the Marseille against Evian match, but the multi-bet was a flop since each of the single bets didn’t work out. To be fair though, and this is the truth, I would have traded the dosh from betting against Liverpool for three points against United. I suppose when you’re betting, it’s best to leave emotion out of it; next week I’m not doing anything to tempt the fates. I’m pretty new to football betting. I’m not all that interested in losing money, so how’s Betegy going to help me? What sets your service apart from the other ones offering some similar services on the internet? 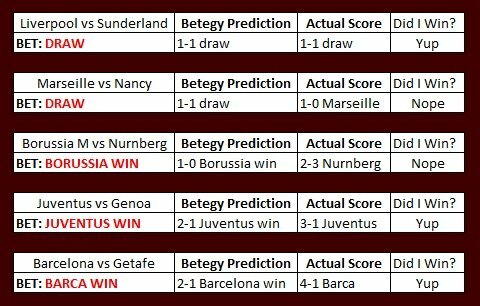 In our opinion most football betting services use tipsters, so one does not really know what their predictions are based on. But though we are a young company we have a solid background because we use stats. Other services are so stuck back in time in terms of design and usability. Whereas, we have a more attractive and user friendly site, and we hope to move this industry with this fresh approach. We do not just provide you with predictions, we also make tips readily available to you when you need them, and showing you those tricks on where to put you money to maximize profit in your favor. We will be bringing some new cool services your way soon. Services like: Personal strategy and virtual bets to give you that added confidence when placing your bets. Besides making money, one of my favorite things about the website was how user friendly feature was. It’s all there in plain English which cuts the guess work down to a minimum. I’ll be the first to admit that I’m not great at math, but the layout, format and the way that the content is delivered all makes things clear as day. During my research, I checked out some of the websites that Betegy will be competing with and, if you’re a first timer or someone who’s feeling a bit uneasy making your picks, there are a lot of options available, but none quite as user friendly as Betegy. The world of sports betting, odds and bookmakers might seem a bit off color when you first get into it, but places like Betegy help to give that edge a smoother touch. They offer a variety of different plans and with more services and competitions to come in the future, this upstart company has impressed me not only with their professionalism, but also with their results. There’s no such thing as a sure thing — I’m sure that goes without saying — but having a real system based on more than just hearsay and conjecture can certainly be a big plus. At Betegy, you’re getting that and little bit more. Editors note: Though I have no strong feelings one way or the other on sports betting, I would think that you would be smart enough to know your limits and play within them. Be safe and enjoy.